Travel the Macabre & Unusual with Eerie America! If you enjoy fiction that brings you to unique historical locations then you will definitely wish to visit these real life places right from your own home. Myth Ink Books is getting behind a Travel documentary that will do just that for you. 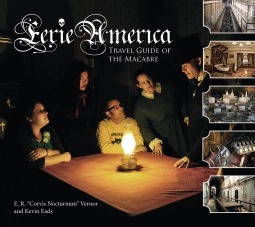 Eerie America Travel Guide of the Macabre series is currently seeking funding to assist in production of an ongoing series available to fans on DVD. Eerie America has been hailed, the book & now the forthcoming travel documentary series as “….the Travel Guide for The Addams Family,” and is “…geared towards educating people on the unique historic locations, fun facts, and promote tourism to some of the most incredible spots across the nation. Eerie America’s special niche is in defining and exploring Dark Tourism – which celebrates the macabre, the unusual, and the strange.” This is exactly what we promote and write about in our stories. Myth Ink Books fully endorses this project as THE travel series to enthrall your sense of real life macabre adventure, to satisfy your desire for delving mysteries of the unknown and edge of your seat drama from some of the most secluded places in our nation. • Museums and themed diversions, such as The Amityville Horror House, New Orleans Voodoo Museum and Count Orlock’s Nightmare Gallery, Sleepy Hollow Cemetery and much more! • Examples of Fine Dining include Zombie Burger and Jekyll & Hyde Restaurant and Bar. • Examples of Lodging include The Lizzie Borden Bed & Breakfast, The Shanley Hotel. • Examples of Shopping include Five Hands Curiosity Shoppe and Boutique du Vampire. Between the show and the companion book, published via Schiffer Publishing, the viewer is invited to continue the journey…the adventure has just begun! The first season is going to go from the French Quarter of New Orleans to Saint Augustine Florida, with a second season planned for Salem MA to Rhode Island and New York where we will thrill you with stories on Edgar Allan Poe, H.P. Lovecraft, to name some of the shows highlights. Like a documentary, occasionally special celebrity guests who have knowledge about a topic or location will make an appearance, such as special guests author Rosemary Ellen Guiley, Monster Quest’s Ken Gerhard, Paranormal State’s Michelle Belanger, Haunted Collectors Brian J. Cano, Haunted Encounters Daniel Hooven and many others! As you can see from the description we borrowed from their IndieGogo Campaign, Eerie America is set to explore far more than have been featured in our literature, and also includes many names that have been involved in our publications. We hope you consider contributing and not only getting some fantastic rewards for your donation but travel with us as we explore Eerie America!